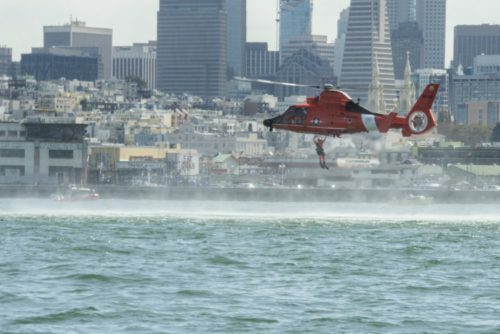 SAN FRANCISCO–The Coast Guard rescued two boaters in Suisun Bay Saturday, after their 21-foot vessel ran aground and began taking on water. Vessel Assist personnel contacted Coast Guard Sector San Francisco watchstanders around 4 p.m., reporting the boaters had run aground in shallow water and their vessel was taking on water. A Coast Guard Air Station San Francisco MH-65 Dolphin helicopter crew and a Coast Guard Station Vallejo 45-foot Response Boat-Medium crew were dispatched to the scene. Due to the shallow depth of the water, the Coast Guard and Vessel Assist boat crews could not reach the stranded vessel. The Coast Guard helicopter crew lowered a rescue swimmer and hoisted both stranded boaters. The Dolphin crew transported the boaters to Buchanan Field Airport in Concord with no reported medical concerns. The helicopter crew consisted of Lt. Samuel Hafensteiner, pilot; Lt. Paul Kraft, co-pilot; Petty Officer 3rd Class Steve Santoyo, rescue swimmer; and Petty Officer 2nd Class Jesus Hernandez-Rivera, flight mechanic. The Coast Guard continues operations authorized by law that provide for national security or that protect life and property during partial government shutdowns; however, there are some impacts to their day-to-day operations.